ASEAN economic ministers ink investment, trade pacts (25/04/2019-16:16:00 PM) The ASEAN Trade in Services Agreement (ATISA) and the fourth protocol amending the ASEAN Comprehensive Investment Agreement (ACIA) were inked by ASEAN economic ministers in Thailand on April 23. CPTPP to help promote Vietnam-Canada economic, trade ties (19/04/2019-14:32:00 PM) The Comprehensive and Progressive Agreement for Trans-Pacific Partnership (CPTPP) is expected to boost economic and trade cooperation between Vietnam and Canada once it takes effect, according to insiders. 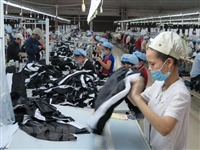 CPTPP: Vietnamese exporters set for bonanza in Canadian market (12/04/2019-16:01:00 PM) Vietnamese exporters are eyeing Canada as ripe for profits thanks to the Comprehensive and Progressive Agreement for Trans-Pacific Partnership (CPTPP), experts said at a conference held in Ho Chi Minh City on April 10. Czech newspaper: Vietnam is a successful development model (12/04/2019-15:56:00 PM) Vietnam has gained significant achievements in the cause of national development over the years, according to an article by Czech Republic newspaper Halo Noviny. ASEAN aims at deepening economic integration (10/04/2019-15:06:00 PM) Bangkok (VNA) - Customs cooperation and healthy financial infrastructure remain the top challenges for ASEAN in its efforts to strengthen economic integration and redistribute economic wealth, reported The Nation – an English-language daily newspaper based in Bangkok, Thailand – on April 8.